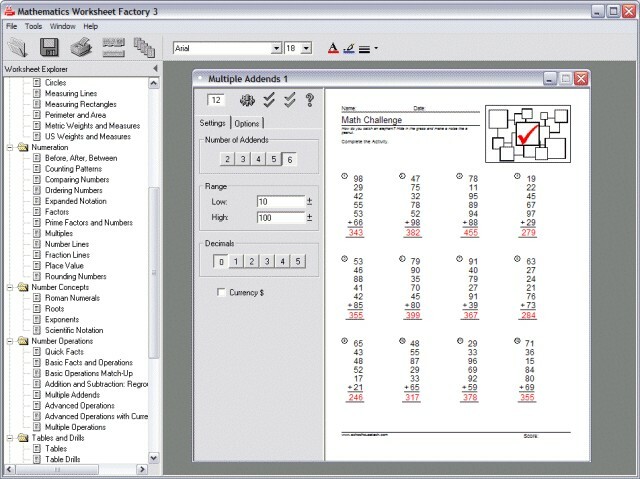 Mathematics Worksheet Factory 3.1 is mathematics software developed by Schoolhouse Technologies Inc.. Create professional-quality mathematics worksheets to provide students in grades K to 10 with the skills development and practice they need as part of a complete numeracy program. Over 60 mathematics worksheet activities can be produced to advance and reinforce skills in number operations, number concepts, fractions, numeration, time, measurement, money, problem solving and more. This program is shareware, which means you can download and use Mathematics Worksheet Factory 3.1 for free during 30-days trial period. After this period you gonna have to buy Mathematics Worksheet Factory 3.1 software for $59.95 or uninstall the program. Mathematics Worksheet Factory 3.1 supports English interface languages and works with Windows 98/XP/Vista. Latest Mathematics Worksheet Factory 3.1 does not contain any spyware and/or advertise modules, allowing installing it with no worries concerning valuable information loss. Our website has thoroughly tested education product Mathematics Worksheet Factory 3.1, written the review and uploaded installation file (8521K) to our fast server. Downloading Mathematics Worksheet Factory 3.1 will take minute if you use fast ADSL connection. WorkSheet Maker is a teaching tool for mathematics.